O God, I was a prisoner, too – yeah! Did you see the smug expression on Bob McCulloch’s face as he set out to justify the actions of Officer Darren Wilson by discrediting the witness accounts of this policeman’s indiscriminate actions in the killing of unarmed teenager Mike Brown? A rather long question I agree, so consider thus while you ponder it. Robert McCulloch’s father was a police officer who was killed on the job in 1964 by an African-American man. Paul McCulloch was killed the evening of July 2, 1964, during a gun battle in St. Louis’s infamous Pruitt-Igoe housing projects. His alleged killer, Eddie Steve Glenn, was a black man who had reportedly abducted a white woman. No one was surprised by the outcome of the grand jury deliberation. Bob McCulloch did not want an indictment. In his mind all his police comrade had done was kill a “demon”. A black demon at that. One like the other black demon that allegedly killed his dad. This outcome is exactly what he designed it to be… Absolution for his comrade in arms… Vengeance ongoing for his fallen father. And so now his only remaining duty was to present the findings of this secret trial in a way, and at a time , to achieve maximum impact. How does one in his position, in a place like Ferguson, Missouri, cover up an injustice? Should he use the dark of night? Should he present his findings in such an insensitively smug way as to inflame the passions of those who were there to protest? Would he collaborate with the other authorities to make sure that his inflammatory response to this tragedy would become a trigger for a fiery response from protesters, thus creating a needed distracting narrative? Well a literally fiery response was what resulted. 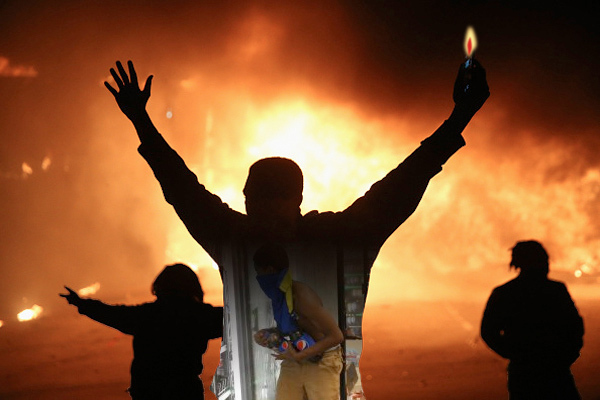 Ferguson burned overnight… And may continue to burn. “Ferguson, Missouri, is waking up to a city that is still smoldering after a night of unrest following a grand jury’s decision not to indict officer Darren Wilson in the shooting death of Michael Brown.